The Healthy Food Development Ltd. (THFD) main business is supplying a wide range of healthier ingredient substitutes and also providing tailor-made innovative market formulations which are consumer ready for all health food and beverage production. Due to our special Research and Development background, THFD can provide unique ingredient formulations, which can allow all manufacturers to produce healthier retail products without any compromise in taste or satisfaction. Here at the THFD manufacturing site we control every step of the ingredient blending process and meet the highest BRC Quality control procedures. All the products offered by THFD can be modified to find new nutritional solutions for all food and drink manufacturing needs. THFD offers a wide range of substitutes which can enable healthier food and drink production for European and global manufacturers. Make your business appointment with us! THFD Team was attending Hi Europe & Ni 2014, Amsterdam RAI on 2 - 4 December 2014. The Healthy Food Development Ltd. (THFD) got an award from Indo British Business Forum (IBBF) in the House of Commons in October 2013. 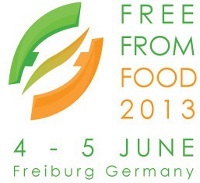 Visit the Free From Food Expo website and learn about the details! THFD was participating The Allergy & Free From Show 2013 in London! ©2019 The Healthy Food Development Ltd. All rights reserved.